Aikido is a Japanese martial art developed by Morihei Ueshiba (often referred to by his title ‘O Sensei’ or ‘Great Teacher’). 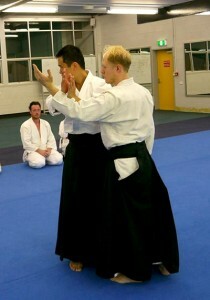 On a purely physical level it is a defensive art involving throws and joint locks that are derived from Jujitsu and Daito Ryu, as well as many techniques derived from Kenjutsu. 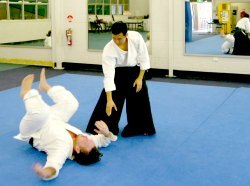 Aikido focuses not on punching or kicking, but rather on using an opponent’s own energy to gain control of them and to throw or immobilise them. It is not a static art, but one of motion and dynamic movement, particularly circular movements. On a deeper level, Aikido is many things to many people. Besides being great self-defense for everyone, it promotes physical health, healing, awareness, balance and peace of mind. O Sensei emphasized the moral and spiritual aspects of this art, placing great weight on the development of harmony and peace. “The Way of Harmony of the Spirit” is one way that “Aikido” may be translated into English. This is still true of Aikido today, although different styles emphasize the more spiritual aspects to greater or lesser degrees. Although the idea of a martial discipline striving for peace and harmony may seem paradoxical, it is the most basic tenet of the art. WHAT DOES A BLACK BELT MEAN? In Aikido, as in many other martial arts, the first black belt level is Shodan. This designation literally means ‘first step’. It is a common misconception that achieving a black belt is the end of the journey. In fact, it is only the beginning. There are a total of 10 subdivisions of black belt, called ‘Dan’ grades, which represent a lifetime of study in the art. It is hoped that by Shodan level, Aikido has become an integral part of the student’s everyday life. In Aikido Yuishinkai, students who reach Shodan rank have previously completed seven (7) kyu grades. The Kyu grading certificates are issued at dojo level and are milestones against which to measure progress. Upon reaching Shodan in Aikido Yuishinkai, the student is issued with an original (numbered) calligraphy created personally by Maruyama Sensei. This is formal acknowledgement that the recipient is accepted as a member of the Yudansha (i.e. persons who have Dan grades). Achieving Shodan level is so much more than counting classes. Accumulating 100 classes over the course of a year is an absolute minimum but far from a guarantee. All black belt gradings are by invitation only and Shodan is no exception. To be invited to grade, a student must have consistently demonstrated (prior to grading day) competence in all of the physical skills of Aikido. In other words, he or she must be able to attack, defend, take ukemi and use the Bokken and Jo with ease. A Shodan candidate must understand the significance of relaxation, calm mind, softness, one-point, weight underside and Ki extension and have incorporated all of these principals into their practice. More importantly, he or she must have consistently demonstrated the attitude necessary to study Aikido seriously. They must have trained studiously, shown loyalty and respect towards their instructors and Sempai, willingly assisted their instructors in class, observed all aspects of dojo discipline and tradition, and willingly helped and guided Kohai following behind them. The Shodan candidate must have demonstrated in word and deed that they willingly embrace and preserve the Founder’s art and the traditions of the Yuishinkai School in all respects. As members of Aikido Yuishinkai Yudansha, all black belt students are personal representatives of Maruyama Sensei and fine examples of leadership to all students in the dojo. Attaining Shodan is a unique experience for every student. Everyone’s journey is different. After years of training, reaching Shodan can be a joyous experience, or it can involve feelings of disappointment. It all depends on attitude and expectations. It is always best to train simply for the love of the art and with no particular focus on gradings and belt colours. After all, from Shodan onwards, there will never be another change of belt colour. It will always be black. To conclude, one of our instructors contributed a quote from Tohei Sensei, “Anyone can go to a shop and buy a black belt. Are they going to ask for your credentials?” It means that being a black belt is a state of mind. It is all about attitude!